When setting out to direct his first narrative feature, filmmaker Joshua Z Weinstein certainly didn’t make it easy on himself. 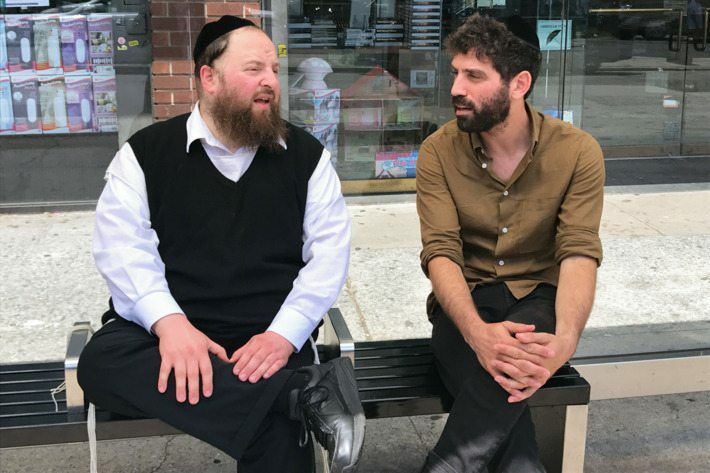 A well-regarded director and cinematographer with a rash of commercial and documentary credits to his name, Weinstein decided to set his first fiction film, “Menashe,” within New York’s Hasidic community in Borough Park, Brooklyn. The neighborhood’s ultra-Orthodox Jewish population isn’t exactly known for being hospitable to outside secular interlopers. And if that obstacle weren’t enough, Weinstein also cast real Hasidim rather than actors, many of whom had never seen a movie before, let alone been inside a cinema. As well, he chose to shoot “Menashe” entirely in Yiddish, a Germanic-based language spoken by the Ashkenazi Jews of Central Europe which dates back to the 9th century, and one Weinstein is not at all fluent in. Indeed, “Menashe” is the first film in almost 70 years to be filmed entirely in Yiddish. Foregoing Yiddish would have been practical for a multitude of reasons, but not for a documentarian such as Weinstein. “This film lives or dies by its authenticity,” he said during a recent interview to promote the film’s release in North American cinemas. This authenticity included loosely basing the story of the movie on the real life events of Menashe Lustig, whom Weinstein cast in the title role. The narrative focuses on Menashe, a grocery store clerk who wishes to maintain custody of his son Rieven after the death of his wife. Because Hasidic tradition mandates that every home with a child must have a mother, Menashe must remarry in order to reunite with his son. Without a new wife, Reiven must be adopted by his tradition-bound uncle. However, in the week leading up to his wife’s memorial service, Menashe’s Rabbi allows his son to live with him in an attempt to remove any doubt Menashe can be a good father. Weinstein elevates what could easily have been a touching father and son bonding story and enhances it by layering in elements that take us inside New York’s Hasidic neighborhoods. This is a community that, though right in the middle of New York City, is rarely visited by non-Hasidic. In fact, finding locations in Borough Park and Crown Heights proved difficult because residents feared publicity that might be generated by a film production. To Hasidim, publicity goes against the traditional practice of modesty. For this same reason, casting Hasidim was a challenge. While many people might clamor to appear in a movie, that is not the case for Hasidic Jews. At times Weinstein and his producer, Alex Lipschultz, would cast a role, only to have the performer drop out after being pressured by their synagogue, family or others within the community. Weinstein and Lipschultz were constantly anxious that those cast in “Menashe” remain committed throughout the production of the film. Casting Hasidim however, meant that Weinstein would be able to shoot his film with natural Yiddish speakers, even if he didn’t understand what they were saying. In order for Weinstein to direct each scene, it would first be rehearsed with the actors in English. This allowed for blocking and performances to be worked out in a manner everyone could understand. Also helping refine performances and make sure they didn’t stray too far from Weinstein’s intent were the translators and Lipschultz, who not only produced “Menashe”, but co-wrote the screenplay. What allowed the filmmakers to work in this manner was a simplified technique they came up with to shoot and edit the film in Yiddish. Part of the complication of working in Yiddish, especially when it came to creating subtitles, is that it is such a varied language. Much like the variations of Portuguese between Portugal and Brazil, Yiddish has countless versions that can differ immensely between neighborhoods, communities and countries. There can be a dozen different ways to say a single English word in Yiddish. Weinstein overcame the language barrier so adeptly in “Menashe” that the film was selected to premiere in the Next section at the 2017 Sundance Film Festival in January where it promptly won critical praise. One month later, the movie received a similar welcome at the Berlinale. A24 promptly came calling and picked up the rights for the film in the United States and China, making “Menashe” the upstart distributor’s first foreign language feature. A24 is now opening the film theatrically in the United States starting July 28, 2017. Weinstein also reports rights to “Menashe” quickly sold in almost every territory around the world, giving the film a great opportunity to garner a large audience in cinemas.